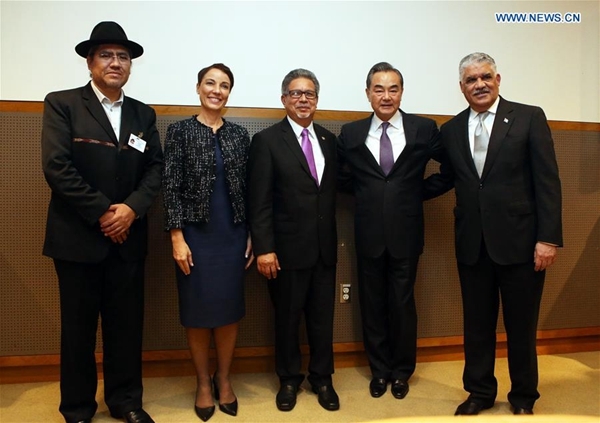 Chinese State Councilor and Foreign Minister Wang Yi on Tuesday said China is willing to work together with the Community of Latin American and Caribbean States (CELAC) to deepen their all-around cooperation and put forward a four-point proposal for the aim. Wang made the remarks while meeting with foreign ministers from the CELAC "Quartet." In the past five years, Chinese President Xi Jinping have paid three visits to Latin America and met with leaders of almost all countries having diplomatic relations with China in the area, said Wang, noting that the comprehensive cooperative partnership between the two sides has stepped into a new stage. After more than three years' development, the China-CELAC Forum has become a major platform for both sides to carry out comprehensive cooperation and is serving as a strong support for the building of a community of shared future for China and the CELAC, said Wang. First, the two sides should lead their cooperation with political consensus, promote mutual understanding and firmly support each other's core interests and major concerns, Wang said, calling for a firmer position against unilateralism and trade protectionism and support for multilateralism and free trade system. The Quartet foreign ministers expressed the CELAC's willingness to work together with China to implement the results of the second ministerial meeting of the China-CELAC Forum and broaden their cooperation in fields of trade, investment, poverty reduction, innovation and infrastructure construction.